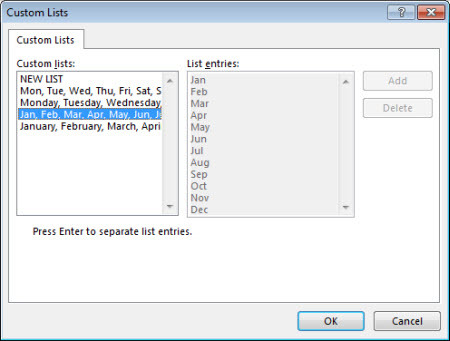 With built-in custom lists, you can sort data—either by days of the week or months of the year. Optionally, you can create your own custom lists to sort by any other characteristic that doesn’t sort well alphabetically—such as high, medium, and low—or S, M, L, XL. With custom lists, you could sort this worksheet either by Delivery month or by Priority. Select the columns to sort. Note: For the best results, each column should have a heading. In the ribbon, click Data > Sort. In the Sort popup window, in the Sort by drop-down, choose the column on which you need to sort. 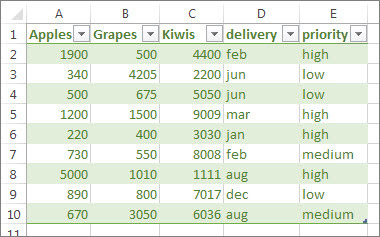 For example, if you want to re-sort the previous example by delivery date, under Sort by, choose delivery. From the Order drop-down, select Custom List. 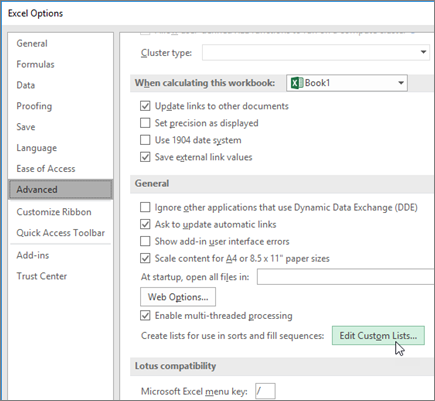 In the Custom Lists box, select the list that you want, and then click OK to sort the worksheet. Select all of the cells in that list, and then click File > Options > Advanced. In the Custom Lists box, click Import. 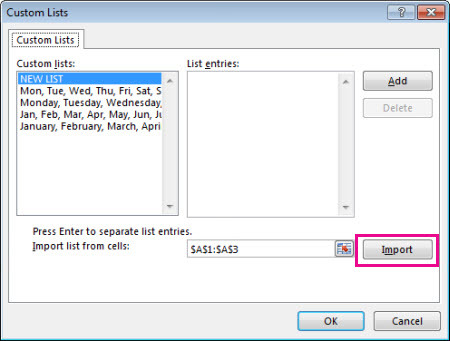 Tip: For a short list—such as High, Medium, and Low, it may be faster to enter it directly into the List entries box in the Custom Lists box.